2014 Shiloh at Canaanland Ota; Heaven on Earth live telecast, 2014 broadcast date is now out – The theme and date for Shiloh 2014 Live Broadcast has been announced by our Daddy in the Lord, God’s servant; Bishop David Oyedepo. Exceeding Grace and Strange Acts is already a reality as proclaimed by the man of God. The President and Bishop of the Living Faith Church popularly called Winners Chapel worldwide (Bishop David Oyedepo) has announced the date and theme of this year’s Shiloh 2014 during the last Leadership Program that took place on the 1st of October, 2014. During the Leadership programme that took place o the first which was specially designed for all the winners church workers, deacons & deaconesses, unit members and leaders alongside all pastors Nationwide, the Presiding Bishop David Oyedepo centred his teachings on Stewardship even as he disclosed that your size in the race of life is a function of your insight into the mysteries of the kingdom of God. Bishop David Oyedepo before dropping the theme of Shiloh 2014 disclosed that without contention, there can never be a possession even as he quotes from Deut. 2:24, Ezekiel 36:37 and Psalms 67:5-7. He also disclosed that where your Joy stops will be where your bountiful harvest will stop likewise. Even in line with Shiloh 2014, God’s servant disclosed that serving God pays; especially if you are serving Him according to His rules and not by grudging or of necessity or because someone is forcing you to serve. Recounting a brief experience of his life to members before Shiloh 2014 live telecast, Bishop Oyedepo disclosed that he knew that things must turn for him and his family when there was nothing actually on ground but Stewardship. The Leadership program that spans over 2hours saw Bishop pouring out his blessings to members of the church via Live broadcast in all viewing centres. All arrangements towards Shiloh 2014 Live Telecast already commenced with prayers and intercession towards that day nationwide. Date, Programme and Venue – Shiloh 2014 live is just a few days away and it will be telecasted here. Shiloh 2014 Live will be broadcasted right here for all those who couldn’t make it to Shiloh 2014 to have a live streaming of the event online via their laptops and smartphones. Therefore, let’s take a recap of the Shiloh event so you get familiar with the live transmission of Shiloh 2014 live streaming. The date for this epic event has been unveiled by Bishop David Oyedepo in the Epistle that was read to all members of the commission recently and the Date falls on December 9 – 13 2014. Therefore get set and prepare yourself adequately for that said date. The theme has also gone forth and revealed by the Bishop so that adequate preparation towards the event will ensue. The theme for this year’s Shiloh 2014 live is “Heaven on Earth” According to the Bishop, it will be a live transforming event where destinies will be met. Shiloh 2014 Live will also be an event of turnaround. Accordingly, Turnaround means different things to different people. For the students, it means from failure to success; for the businessmen (breakdown to breakthrough) to the poor, it means prosperity and to the sick; healing. The God of turnaround is set to meet all participants at the points of their needs. Here are Shiloh 2014 programme highlights for all those that will be traveling to Canaanland, Ota and all those that will be watching the event live. Shiloh 2014 Morning Session – The Morning session of Shiloh 2014 live will kick-start by 7am. This is the morning session of the event and will last between 7am and 11am. This will contain a series of 3 Teachings. Shiloh 2014 Healing School – The healing school will be coming up by 11.30am to 1.30pm daily just immediately after the morning session. This particular session is for those oppresses and all those who need a touch of the spirit. Shiloh 2014 Business Summit – All business oriented individuals, businessmen and business women are to be a part of this particular session. The time is 11.30am to 1.30pm daily. Shiloh 2014 Youth Alive Forum – For all youths, this is the session for you all. The Youth Alive forum will kick-start by 3pm and ends by 5pm. Issues pertaining to all the youths will be discusses here e.g. relationship matters, dating, godliness, etc. 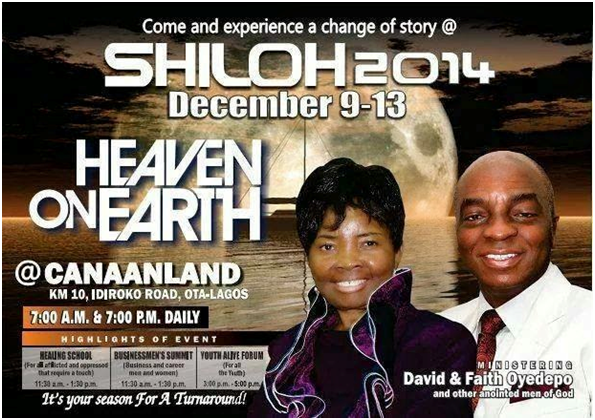 Shiloh 2014 Evening Session – This is the much anticipated programme of Shiloh 2014 Live and you must not miss any of it. The evening session kicks off by 7pm and runs till 10pm. The Bishop himself will be teaching during this session. Please note: Shiloh will be transmitted here live by visiting the link below.